Michael L Mort sent this fascinating photo. My Grandmother Mary Hagan with her children, Joseph Drury, son by her first husband of the same name, who died aged 21 of Pneumonia after an accident. My Father Leonard Mort, Amy Mort,and baby Florence Mort. 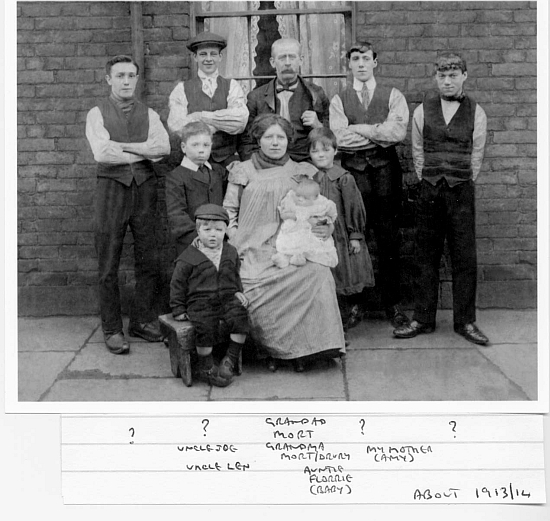 The elderly gent is James Henry Mort My G Grandfather, The four youths are unknown to me but as they appear on other family photographs and have the looks of other members of the family, They must be family members but I am not sure where they fit in. Possibly children of James Henry Morts Brother and sisters.